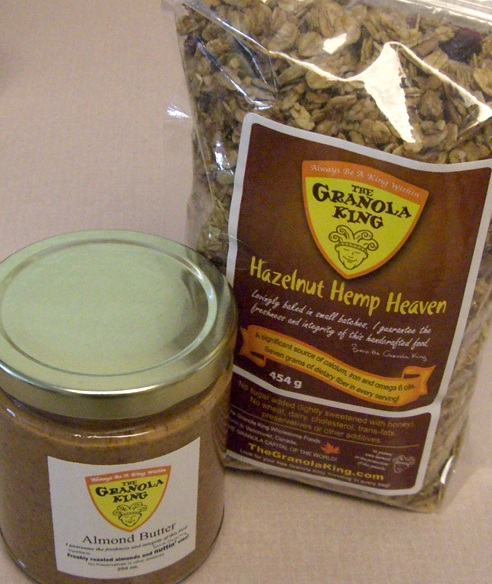 Made a trip to Granville Island just to buy 2 bags of Siegel’s day olds… hmmm 2 dozen bagels. You never know what you’re getting (well, you do, you can see it, but what I guess I’m saying is that you never know what kinds they have left over and bagged up), but still…both T and I agree it is simply.. aaahhhhhhh. Bagelicious. This time it was a dozen poppy seed and a dozen of mixed (mostly rosemary and rocksalt, some cranberry). Went through half a bag before the rest made it into the freezer (hence the two bags. 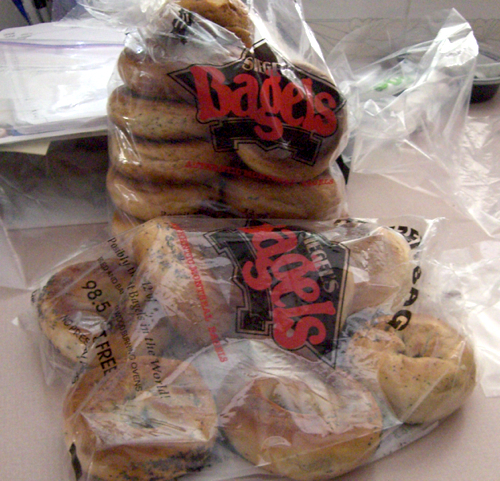 I made the mistake the first time I got these: I bought only one bag and had only 3 bagels left to freeze). Now when I open my freezer I see a sea of bagels. Hm, in fact the freezer is mostly bagels and bread right now. There’s some frozen halibut (emergency rations for when it’s no longer halibut season), several bags of shelled edamame (my snacks), some frozen berries and mango (for shakes), a pack of smoked salmon, and a few small bags of frozen fish and meats. But seriously, over 80% is bagels and bread. MWAHAHA! OK, so this is not so much a Steveston post than it is a Surrey post, since Fieldstone is actually located in south Surrey. 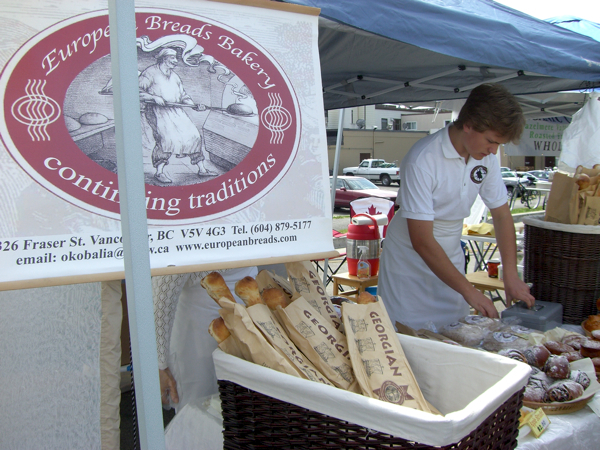 Nevertheless, they have decided to grace those of us up north with their fine, fine breads and pastries at the Steveston’s Farmer’s Market. 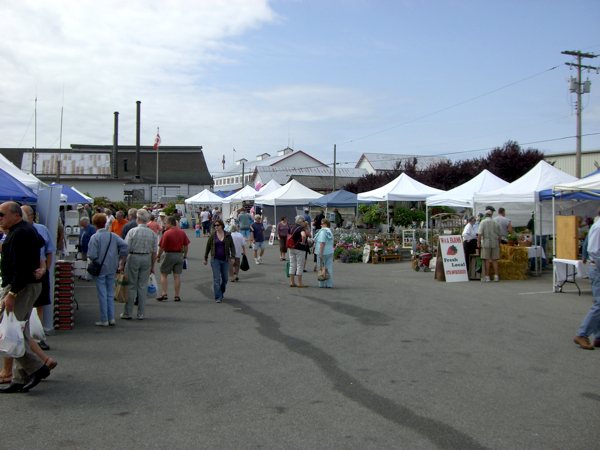 Hence, Part II of the Steveston Series is entirely devoted to Fieldstone. 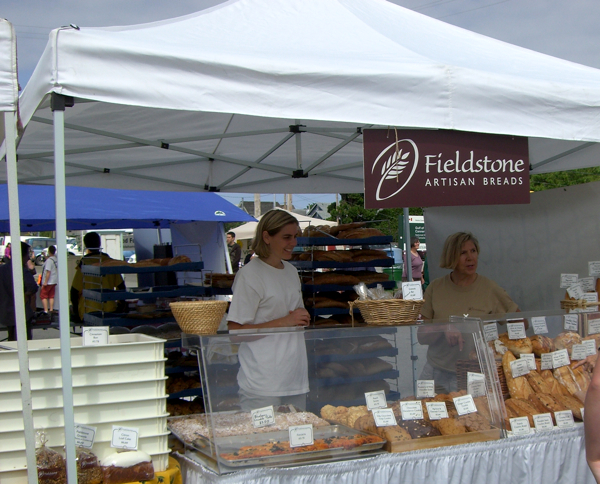 Fieldstone uses organic flour, and all of their country breads are made by natural leavening. Basically, to me, their naturally leavened breads taste much less yeasty and has a nice, mild and not commercial tanginess to them. Of course one of the very first breads I pick at a bakery is a plain baguette, so I tried their Parisian Baguette, pictured above. It was delicious, one of the best. Really chewy, crispy crust, chewy inside. I had it with some of the lobster oil I got from the Cannery. Really good. This past weekend I went and got their multiseed baguette. The various seeds that I could find were poppy, fennel, and pumpkin. The fennel was definitely present but not too overpowering, which I liked because I don’t really like licuorice-y tasting things. 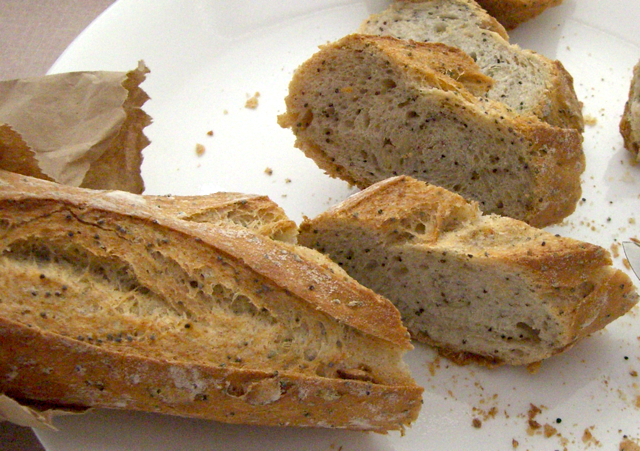 And it coupled nicely with the poppy seeds- fragrant, aromatic, chewy and tastey! This was so good I went through almost a whole baguette while walking around the market and went back to get another one. 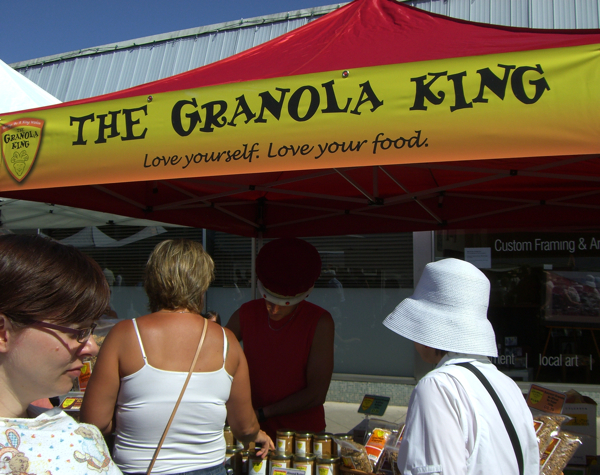 Also tried their cranberry granola: pretty good like a home-made bar. 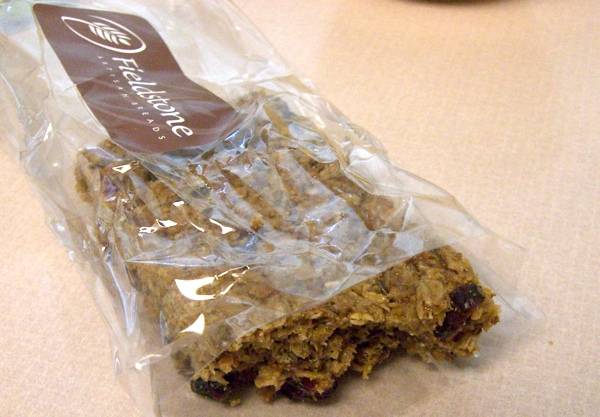 Hard, partly crunch and partly chewy, and sweet. Also awesome were their large ooeygooey cinnamon buns and croissants. This bakery is not to be missed, hence all the line ups. 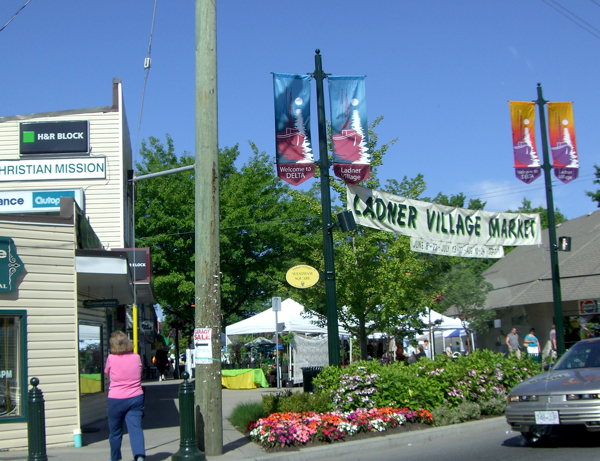 If you only come by here (or south Surrey) once in a blue moon, stock up! 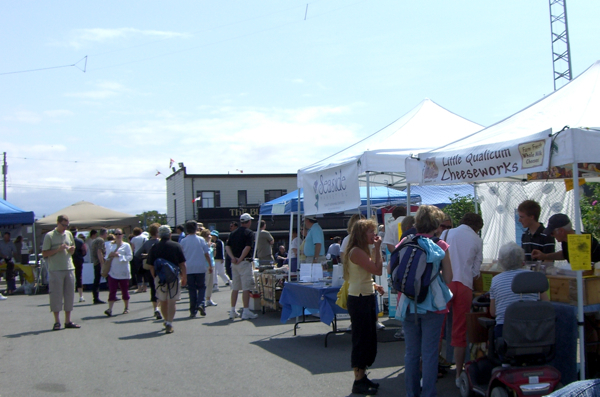 Here is Part 1 of my multi-part series on historic Steveston: the first annual Steveston Farmer’s Market. 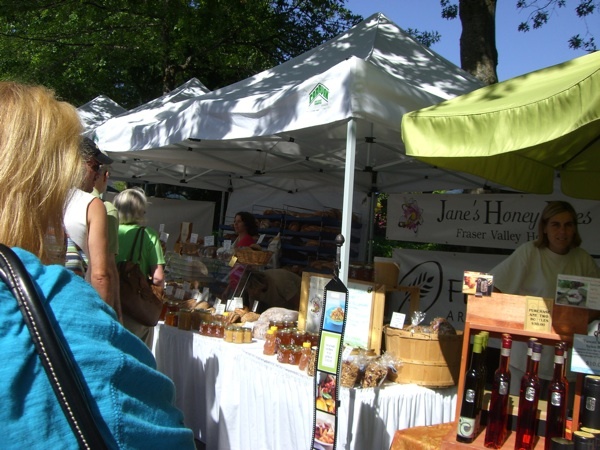 The first stop was the Fieldstone Bread‘s stand, because from previous visits to this market we know the longest lineups are here. More on Fieldstone later in the series. I’d have taken more pics of the fruits and veggies- there were mainly strawberries, cherries, summer veggies, organic tomotos (bought a pound of sweeeet cherry tomatos)… but the giant pods of okra were cool, and of course the squash blossoms from my previous post. 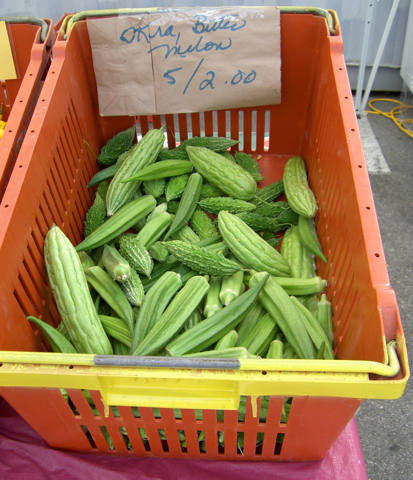 They were fat, and about 6 inches long, probably almost twice as big as the okra that I usually get at supermarkets! 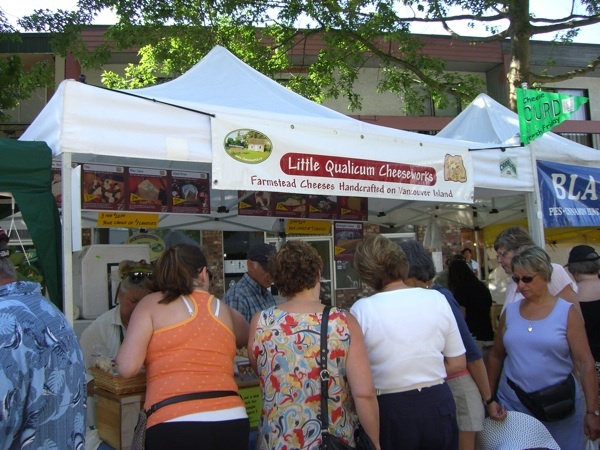 Also bought some locally grown, Richmond strawberries, which were quite sweet, but not super sweet. A pint for 5 bucks… Tried out some Okanagan cherries but they weren’t as sweet or as crunchy as some of the US of A ones I’ve been buying. So didn’t get those. Overall it kind of sucked that these “local, organic” foods were a lot more expensive than what I find at Asian markets. Pricier, and not necessarily as good. 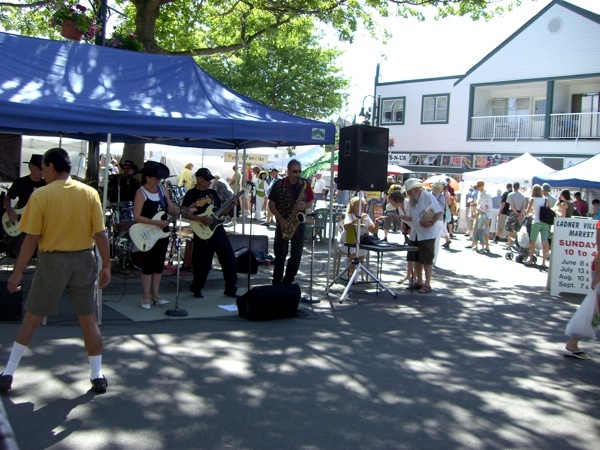 In terms of entertainment, there was a cooking lesson/show, live music, and dancing! 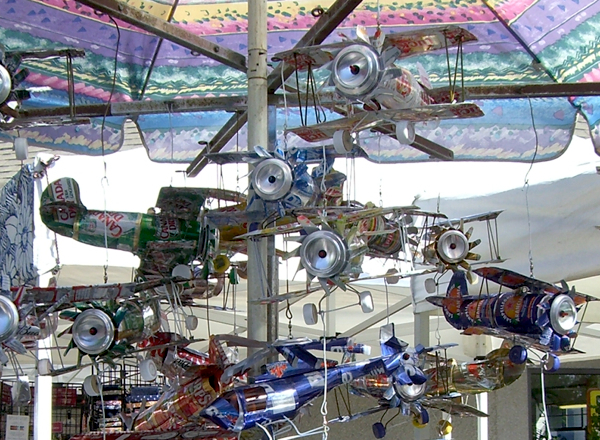 Still, you can spend a fun day here, even though some stands aren’t really worth the time. 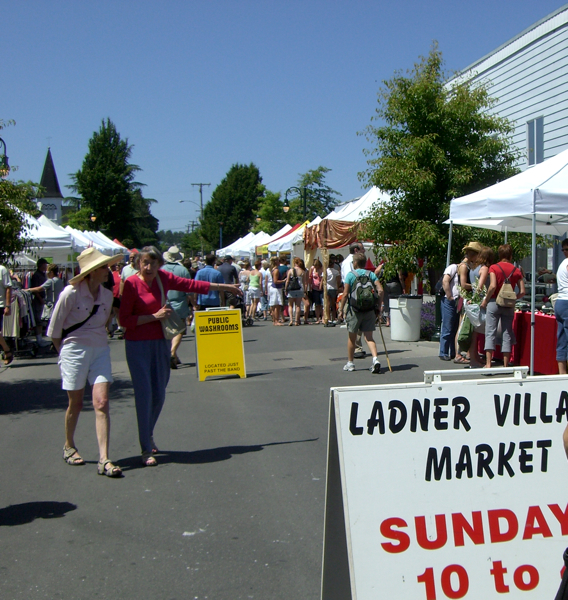 Just make sure you get here early, you’ll be sure to find a free, nearby parking spot, and get first pick at fresh produce. 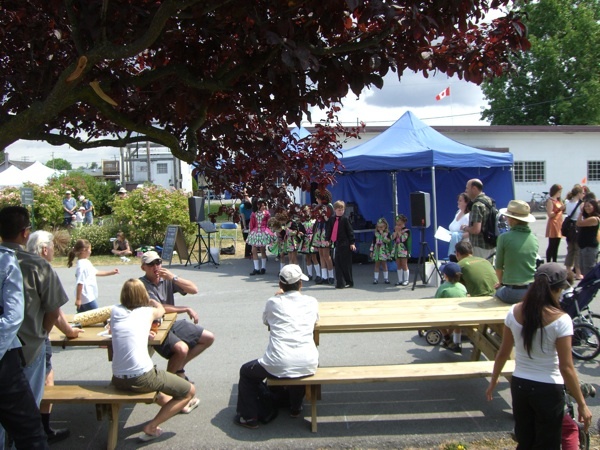 Once you get bored you can always take a stroll out to Garry Point or the Steveston Village. That’s all for now! 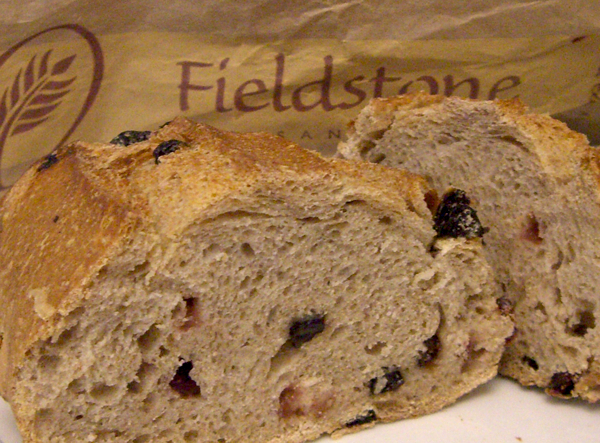 Next up in the series: review of Fieldstone Breads! 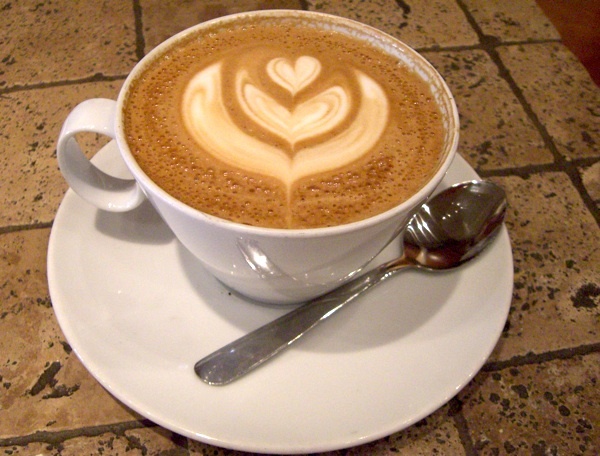 Caffe Artigiano 06.28.08. Betty’s 86th. This day was special: it was one of E’s old neighbor Betty’s 86th birthday. We didn’t know this – we had drove by to see E’s old place in the neighborhood, and happened to see Betty’s niece in the garden and were invited in to say hello. E hasn’t seen Betty for over a decade and Betty’s starting to suffer from dementia but still remembers E fondly. After we found out it was her birthday that day (and after having said latte at Artigiano), we went down to Michelle’s Cake house on W. Boulevard and got her a tiramisu. Too bad I didn’t take a picture of it, it looked quite pretty. I would have chosen the fresh mango cake but Betty seemed more like a Tiramisu kind of gal. Anyway, Michelle’s Cake House is an Asian bakery, and makes fabulous cakes and pastries. There was a gigantic lineup when we were there; they take numbers. More 金磨坊 (La Patisserie) goodness. Very light, heavenly cream puffs from La Patisserie. They’re tinier, but much better than Beard Papa’s. (I’m not an expert, but this is according to a certain cream puff afficionado). I got sucked into this little place called Bagel and Coffee, it was across the street from my (very Japanese) hair stylist, and I’ve been meaning to check it out. Bagel and Coffee is located on the south side (ie. side facing McKim Way) of Pacific Plaza – on the corner of Cambie and Garden City in Richmond. It’s the giant words Coffee and Bagel that lured me in, because – well, it’s coffee and bagels, why else? It was a rainy day, almost lunch time, there was one guy sitting outside and I think another customer inside the little shop. The decor is quite pleasant and warm, and it was clean inside. The woman working there gave a very friendly welcome as I walked in. She speaks Mandarin, although I don’t. Anyway, today’s bagel was whole wheat, she touted (at least twice as I can remember, I think it’s because whole wheat is soooo good for you). So I got one. It was still warm. From the looks of it i should have known better. Or at least I should have when I sniffed at it. Of course it smelled like that very characteristic smell of whole wheat, which isn’t the problem, but it smelled so doughy and underbaked that I should have known better than to sink my teeth in it. Of course I did. And it was just… ugh. Gross. It wasn’t really underbaked, but it felt like it. The outside was not tough, it wasn’t even bagel like. 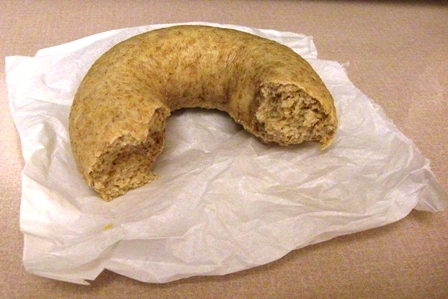 It was heavy but it wasn’t the right kind of bagel-dense. It was like somebody’s first ever attempt at making bagels and they forgot to boil it or something. I just. Ugh. I’m sorry. I can’t continue on with this post. I didn’t try their coffee. Maybe it’s better. Maybe somebody else would like to try it and tell me what it’s like, because I’m not going back soon.